Henry (Ewan McGregor) works for a Japanese company, and takes his wife, Maria (Naomi Watts) and three kids, Lucas (Tom Holland)Thomas (Samuel Joslin) and Simon (Oakley Pendergast to Thailand on vacation. 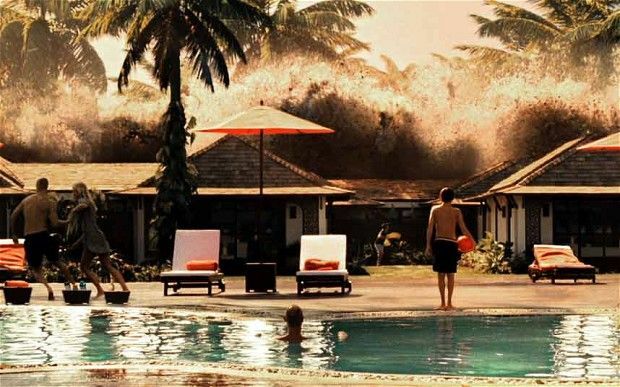 No sooner do they get settled in their hotel, and start swimming in the pool, when a monster tsunami hits Thailand, Indonesia, India and Sri Lanka, and devastates everything in its path. The tsunami splits up Henry and the family, Lucas and Maria end up together. Maria is gravely hurt, somehow they climb a tree with another young toddler in tow and wait an agonizingly long time for help to arrive. Maria and Lucas are finally taken to a hospital, but Maria is too badly injured to be taken to surgery. In the interim, Lucas takes down names of strangers who are missing family members, and even re-unites a man with his son. One day, Lucas arrives where his mother was resting only to find his mother gone. A friendly caretaker (Ploy Jindachote) helps Lucas find his mother but she is still too weak for surgery. Can the doctors stabilize her enough to operate on her? Where are Henry, Thomas and Simon? Are their lives taken by the devastating tsunami? I wanted to watch The Impossible because I wanted to remember what I felt like almost ten years ago when that tsunami devastated Indonesia, India, Thailand and Sri Lanka. I was in shock that one natural disaster could take such a heavy toll. This movie does an excellent job of physically recreating the damage done by the tsunami, and I give the filmmakers credit for tackling a story that’s extremely difficult to tell, but this is a movie with surprisingly many shortcomings. It’s based on a true story, but the real family was Spanish, the movie family is British, so again, like The Butler, how many liberties did the writers take with the actual story? I didn’t like the ethnocentric focus of this movie, if viewers knew nothing about the tsunami of 2004, they would think that all the victims were European, because Europeans are the only victims shown in this movie. The reality is that hundreds of thousands of people died as a result of the 2004 tsunami, most of whom were Asian. Other than the caretaker, and a nurse, none of the characters in the movie were Asian, that’s not right. This is a movie that almost demands a tragic ending, to reflect the tragic circumstances of the storm, I won’t tell you the ending, you have to watch it yourself to see if it’s fitting. The writers even write in some product placement involving a can of Coke, hardly appropriate for a tragedy of this magnitude. One big reason to watch this movie, despite whatever shortcomings the script may have, are the performances. Naomi Watts has a physically grueling and emotionally taxing performance. She gives her all in this performance, there is nothing left behind, no physical or emotional pain unmined. She is the soul of this movie. Ewan McGregor gives a similarly strong and emotional performance. He is such a versatile actor, and is so good in so many different roles, Big Fish, Salmon Fishing in The Yemen, Attack of the Clones Revenge of the Sith, he brings an incredible vitality and humanity to all his roles. The kids are all very good also, they are very mature at times, yet very vulnerable at others. The story is long, but the pacing is good, so the movie doesn’t drag. The visuals speak for themselves. The scenes of devastation speak in ways that words cannot express. Those scenes by themselves make the movie worth watching. The Impossible: Great acting and incredible visuals make the impossible possible. When he was a child, Edward Bloom (Ewan McGregor) feared nothing. There was a local folk tale in Ashton Alabama that a witch (Helena Bonham Carter) lived nearby, and if anyone looked into her one eye with a cataract, they would know how they would die. He did look into the witch’s eye and he found out how he would die and it made him even more fearless. Edward had decided that he was too big for Ashton and moved on to Spectre Alabama, but before he left Ashton, he rid the town of a giant named Karl (Matthew McGrory) the giant was not mean, just hungry. Edward reasoned that Karl just needed a bigger town to eat in. So they move on to Spectre, but Edward doesn’t stay long, the townsfolk claiming that he came to visit Spectre too soon. Edward and Karl move on to work at a circus for Amos Calloway (Danny Devito) where Karl signs on as the new giant and Edward meets the love of his life Sandy (Allison Lohman) Edward agrees to work for free for Mr. Calloway just to find out more information about Sandy. Edward finds that Sandy goes to Auburn University and that she’s dating a rival from Ashton named Don Price (David Denmen) Edward swears he will win Sandy over, and he does, by getting beat up by Don and not laying a finger on him. After the marriage, Edward is conscripted by the US army and agrees to go on a secret mission behind enemy lines in Korea. Sandy fears he’s dead. Not to worry, Edward is very much alive, and brings back two Siamese twins from Korea to work in the Calloway circus. He returns happily to a life as a door to door salesman. Near the end of his life, Edward’s son Will (Billy Crudup ) is grown, and he’s tired of hearing his father’s tall tales of giants, and secret towns, and especially how he caught a big fish with his wedding ring on the day Will was born. Will does a little investigating, what does he find? This is a fabulous movie, a fable, an allegory, if you will. This is a visually arresting movie as all Tim Burton’s movies are, but the scenery changes perspective as Edward grows up. The town of Spectre is a perfect example, when he first enters it as a young man, everyone is happy and the town is brightly lit, like something out of a holiday greeting card. When Edward returns to Spectre, the town resembles the ghost town of its name, dry and desolate. Maybe the town hasn’t changed at all, maybe only Edward’s perspective has changed. Edward is fearless from the start, he looks into that witch’s eye, and sees his death and takes it as a sign there is nothing to fear, so he doesn’t fear the giant, he doesn’t fear getting beaten to a pulp by Don Price, and he doesn’t fear parachuting behind enemy lines in Korea. I found his attitude to be refreshing. I also found it interesting that Edward won Sandy’s heart by not resorting to violence. Edward sees the best in all people, and that counteracts the cynicism of his son Will. The acting is first rate Ewan McGregor could charm the birds from the trees, and often does, with as little as a smile and unending optimism. Albert Finney is also wonderful as the older incarnation of Edward, just as charming and brimming with confidence as McGregor. Helena Bonham Carter is both sweet and scary as Jenny & the Witch, a nice balancing act. The direction by Burton is superb, alternating from dark and desolate to a daydream like haze. Movies are a visual medium, and no one understands that better than Tim Burton. In 2003 reporter Wilton is in Iraq, after a bad breakup with his girlfriend, trying to prove his manhood and he runs into none other than Cassidy, who’s on another mission. Little do the idealistic Cassidy and Wilton know that Django is now working for Hooper at a mercenary paramilitary outfit. Do Cassidy and Wilton rescue Django, does Django redeem himself? This is an ultimately disappointing movie, because it has such a good satirical premise, and lots of laughs during the first hour, and then during the last half hour the story gets muddled, and maudlin, and it can’t decide if it’s a funny movie or a serious one. Ewan McGregor gives another good performance, although his American accent needs a loy of work. 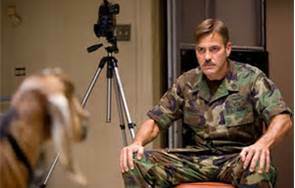 Clooney is funny in this movie, although with a mustache, he looks like Tom Selleck. Spacey does what he does best, play a grade A jerk. Jeff Bridges gives an ok performance, but I think he’s stealing from his own character, “The Dude” in the Big Lebowski, which was a much funnier movie. Too bad this one ran out of steam. The Men Who Stare At Goats. Not baaaaad, not good either. But there are fundamentalists in the sheik’s inner circle who think that by bringing fly fishing to Yemen and by consorting with Westerners, the sheik is going against the will of God. They plan an assassination attempt against him. While the sheikh faces danger, Fred and Harriet become closer as their time in Yemen continues. Fred is in a loveless marriage, and Harriet is sure that Robert is dead, so naturally their feelings for each other grow. But Patricia Maxwell has a surprise for everyone. What is Patricia’s surprise? Does the assassination plot come to fruition? Do Fred and Harriet’s love for each other grow? Or does Fred return to his loveless marriage? This is quite a wonderful movie not only about fishing, and love, but also about faith. The sheikh has a beautiful soliloquy about the virtues of fishing. Fishermen don’t care about race he says, they only care about the fish, the water, and the game the fisherman and fish play with each other. As a fisherman myself, I know I revel in the beauty and simplicity of nature, and fishing allows me to commune with that beauty. This movie speaks to that beauty in a spiritual, not necessarily a religious way. That’s what sets this movie apart from the typical romantic comedy, it speaks to more than just the relationship between Fred and Harriet, it speaks to an awakening faith in Fred, more a gut feeling than a religious awakening, that miracles can happen if a person believes in something strongly enough. It is a very funny movie to boot, not in a broad, slapstick way, but more in a subtle and genteel way. Some of the subplots, namely the assassination plot and the missing British soldier seems contrived, but that hardly detracts from the central themes of this films. The performances are outstanding, Ewan McGregor is one of my favorite actors, especially in flights of fancy such as this movie and Big Fish, he is an extraordinary whether in an underestimated role like here or a hero role, like Obi Wan in the later Star Wars movies, he can play both with equal aplomb. Bravo to Amir Waked for a wonderful performance as a man who is perfectly reasonable in his outlook despite his oversized dream of bringing salmon fishing to an arid part of the world. Bravo to the writers for not making him another one dimensional Arab stereotype. Since I’ve read that Waked is the “Arab George Clooney” I hope he gets many varied roles to play in the future. Emily Blunt gives a sweet, sensitive performance as Harriet, her comedic timing and chemistry with McGregor is excellent. But the movie is absolutely stolen by Kristen Scott Thomas, her acerbic wit and acid tongue made me laugh out loud several times, who knew she had such an excellent comedic performance in her? I’m used to seeing her in ultra-serious movies like the English Patient. A great performance. For the most part this movie has very good writing as well, by the writer of Slumdog Millionaire. The cinematography is breathtaking, Scotland and Morocco look incredible, like postcards. 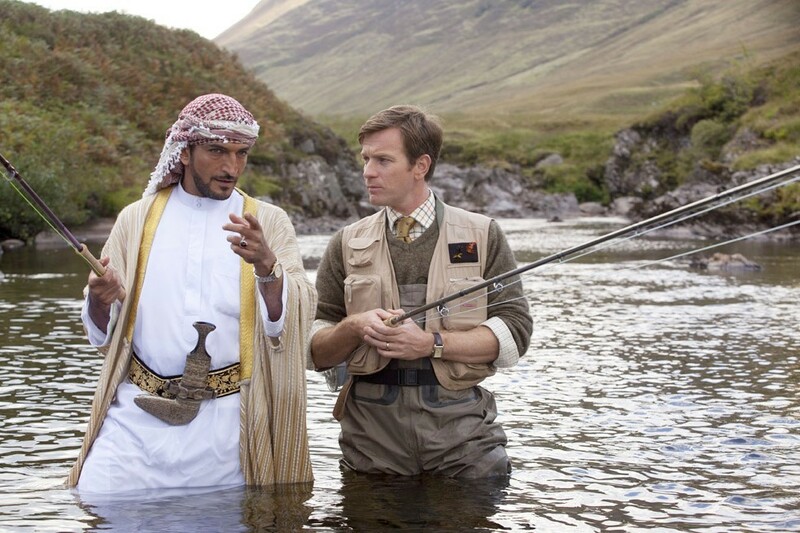 Salmon Fishing in the Yemen. Take a flier on this fly fishing fantasy.